An international research team has developed a simple method for using a network of autonomous time-lapse cameras to track the breeding and population dynamics of Antarctic penguins, providing a new, low-cost window into the health and productivity of the Antarctic ecosystem. The team of scientists from NOAA Fisheries and several other nations published in the journal Methods in Ecology and Evolution, descriptions of the camera system and a new method for turning static images into useful data on the timing and success of penguin reproduction. They say that the system monitors penguins as effectively as scientists could in person, for a fraction of the cost. 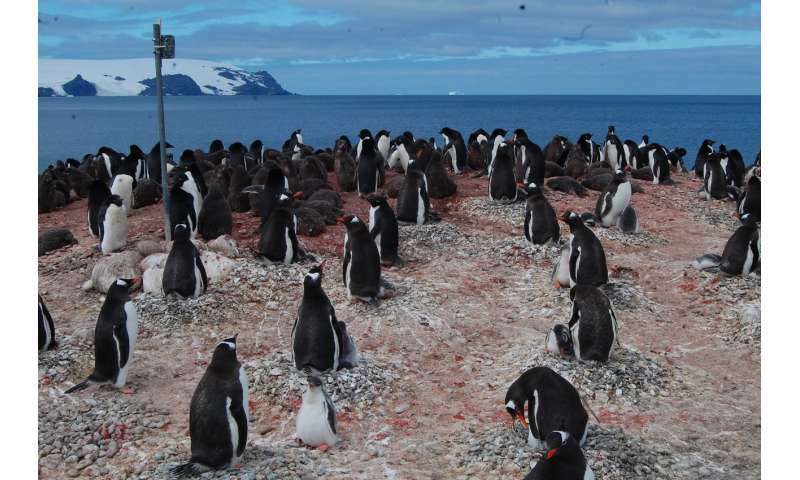 The network includes 51 cameras across the Antarctic Peninsula and the South Shetland Islands, set on posts several feet above ground and programmed to shoot 12 photos a day during daylight hours. Researchers typically visit once or twice a year to download photos and replace camera batteries. Funding for the project came from the Commission for the Conservation of Antarctic Marine Living Resources (CCAMLR). "These cameras provide an opportunity to put more eyes on the ground to understand broad-scale responses to changes in the environment," said Jefferson Hinke, a research biologist at NOAA Fisheries' Southwest Fisheries Science Center and lead author of the new paper. "It helps us understand what's happening to these animals in a way that's affordable, robust, and accurate." The network was designed to monitor three species of Antarctic penguins: gentoo, Adélie, and chinstrap. For each species, stereotypical behaviors in the nest are the key to turning images into useful data. While two penguins typically tend to their nests before they lay eggs, once they have eggs just one penguin stays on the nest. By watching for such telltale signs, biologists reviewing the photographs can quickly estimate when the penguins lay eggs, and how many nests are successful each year. The penguins, like much of the wildlife in Antarctica, feed on a food web that depends heavily on Antarctic krill, shrimp-like crustaceans that fishing vessels also harvest for use in nutritional supplements and other purposes. Tracking penguin numbers and reproduction over time and space with the camera network provides insight into the productivity of the ecosystem. The authors are hopeful that fisheries managers can draw on this new stream of information when managing fishing pressure on krill. The U.S. is the largest consumer of Antarctic krill products in the world. "The camera network is an effort to expand the scale of monitoring to more effectively deliver advice on the status of predators for precautionary fisheries management," the authors wrote in the new paper. "A standardized method is intended to streamline data collection and analyses to support the provision of management advice." "Automated, remotely operating time-lapse cameras can't replace people entirely, but they can make reliable observations of many things, are extremely cheap and reliable, and can be deployed to operate in very remote locations," said Colin Southwell of the Australian Antarctic Division and co-author of the new paper. "Cameras have allowed us to expand the spatial extent of our monitoring dramatically within the constraints of limited budgets, giving a much broader view of how penguins and the marine environment are faring and improving our chances of distinguishing between different kinds of human-induced impacts such as fishing and climate change."